A single branch tastefully overlays the cone shaped mica shade in this elegant table lamp from our Classic Mica Collection. 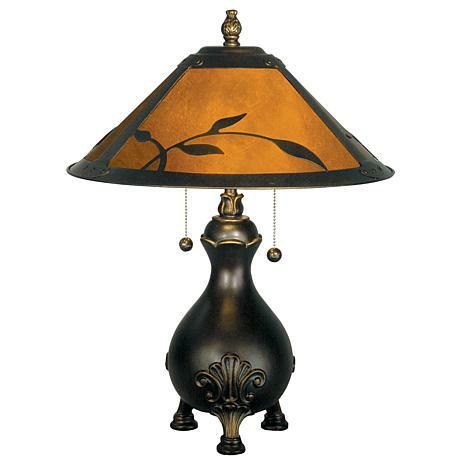 The leaf pattern, set against the deep, rich amber of the mica shade will radiate warmth when this lamp is lit. The jar shaped footed base, which is finished in antique golden sand features a classic fleur di lis design. 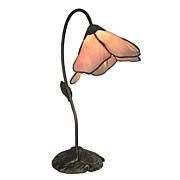 Perfect for a den, study or office, this glowing lamp will soon become a family favorite. 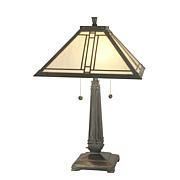 I was very happy to see the quality and beauty of this lamp in person. Very substantial, perfect in every way. Worth every penny. It was a gift for my mother and she loves it. Everyone that has visited raves over it and at night it's even more beautiful! 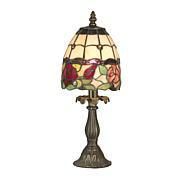 This lamp is beautiful! I have had many compliments on it. The price is great for the quality of the product. I would recommend it to anyone! This lamp has a very soft glow to it when on. The shade is made of a gold colored plastic material with the tin like leaves over it. I expected it to be a little more chunky, or maybe the base to be larger over all. I'm somewhat disappointed in it's over all size, yet love it too. blends well with country decor. I returned this item. Arrive with the shade bent in several paces. Shade is made of what appears to be cardboard/plastic. It's really not worth the price. 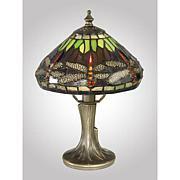 I have many Tiffany lamps and none are like this. Not good quality for the money.Priced way to high.